Sunshine for Your Heart-sharing the hope and love found in Jesus: Celebrate Veggie Tales "Noah's Ark"! Celebrate Veggie Tales "Noah's Ark"! Today's post is sponsored by Family Christian Stores. I received a screener DVD of the upcoming Veggie Tales movie, "Noah's Ark", in which to write a honest and unbiased review. Veggie Tales told their story of Noah in a unique way. Noah's son, Shem, had just returned from his honeymoon to see the giant Ark (orange slice) sitting in the exact spot that he wanted to build his new house. He wasn't happy with God's plan nor his father for carrying it out. His plans were all "messed up" by Noah obeying God. He just couldn't see how this could be God's will. Furthermore, he had some serious trust issues. He felt like waiting on God was a waste of time. Finally, Shem decided to come up with a "Plan B". Now, I must admit that sounds familiar! Sometimes when I am waiting on God, I am tempted to come up with my "Plan B". However, it doesn't take long when I, like Shem, realize that my plan was a flop and that God had it under control the whole time. One by one, God kept all the promises He had made to Noah and his family. The beautiful rainbow was to remind them all of His promises. Needless to say, Shem had a change of heart and soon realized that God is trustworthy and faithful. What a wonderful reminder that we are to walk by faith, not by sight. I know you, your kids, or your grandkids will love the Noah movie. It is filled with beautiful singing and even new animation. Now, I must confess, being an old school Veggie's fan, that the new animation was a challenge at first. However, the wonderful story line won me over! "Noah's Ark" is scheduled to be available for purchase on February 28th. However, you can pre-order your copy NOW and get the Veggie Tales "Rack, Shack & Benny" DVD free! What an awesome deal! Furthermore, it would be a fun idea to have a "Noah's Ark Premiere Party" for your kids or grandkids. 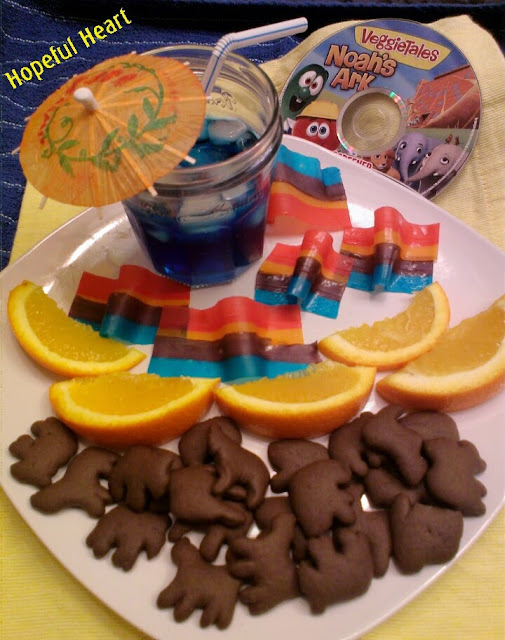 You could serve animal crackers, fresh orange slices, rain water (blue Gatorade or juice), and "rainbows" made from fruit roll-ups! (pictured above) I want to encourage you to celebrate God's faithfulness and enjoy this kid-friendly movie with your family. I want to thank Family Christian for sponsoring today's blog. Don't forget to sign up for the giveaway for a $10 Gift Certificate for Family Christian on the top of this page! I hope you all have a wonderful weekend and don't forget to pre-order your movie today!